I don't like mayonnaise. It's necessary in some things - potato salad, tuna fish; there's probably something else, but I can't think of it right now. 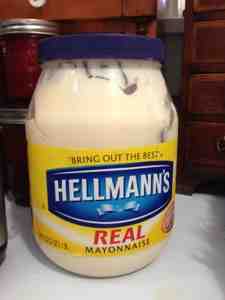 Bob, on the other hand, uses mayonnaise as a condiment like mustard, putting it on sandwiches. So, we keep it in the house. Costco has both Duke's and Hellmann's mayonnaise. Last year, never having tried it before, I bought Duke's to try. I'm NOT saying there is anything wrong with Duke's, and you can definitely get it at Costco. I'm just saying, I will be buying and eating Hellmann's in the future, and so will Bob. I like how you say "tuna fish" for tuna salad just like my mom's family. Are you from Nashville originally? The other thing is egg salad! And, of course, pimento cheese (salad). I've been in the South, North Carolina then Tennessee for many years, but originally from Pennsylvania Dutch cooking culture. Yes, on the egg salad; pimento cheese is not something I've ever made. My most recent experience with it was trying to convince Bob that the Jalopeno Greek Yogurt from Costco tasted just like pimento cheese. That was not too successful.